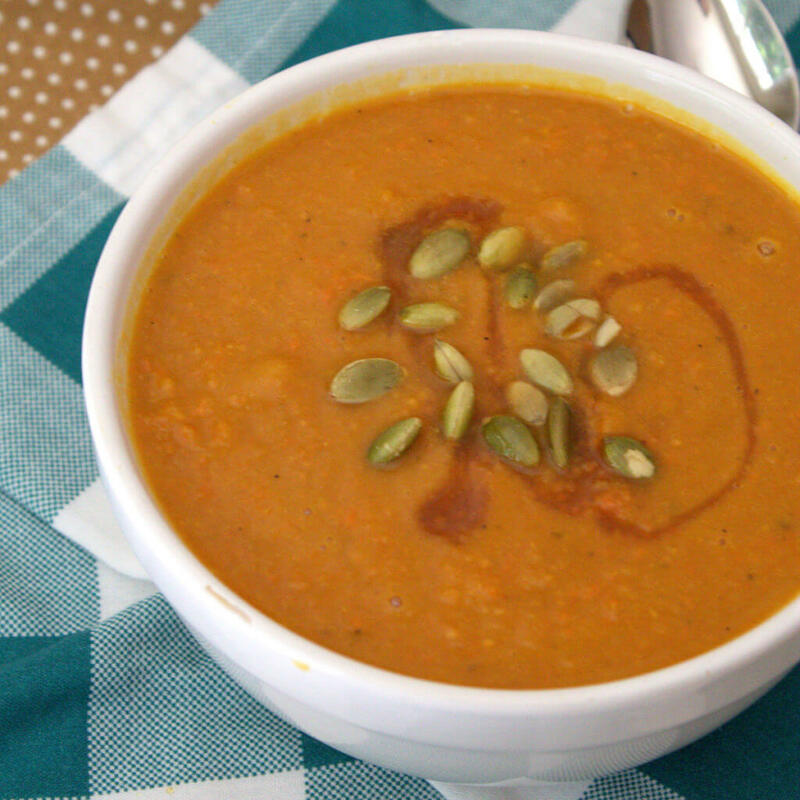 This classic fall soup is wonderfully flavorful, creamy, and comforting. 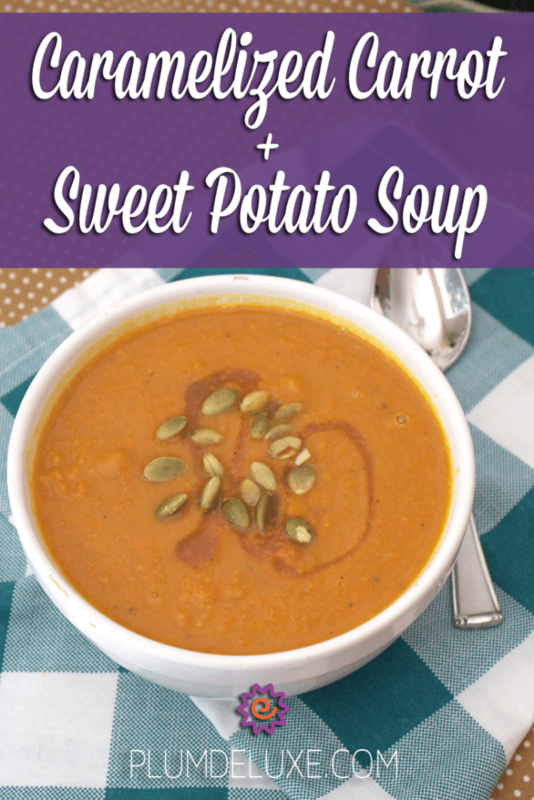 The use of root vegetables — which are just ready to be harvested at this time of year and stored to be used all winter long — means that you can recreate this caramelized carrot sweet potato soup recipe for months to come. By roasting the carrots and sweet potatoes first, it allows the natural sugars in the vegetables to caramelize and the flavors of the veggies to really shine in the final dish. Once they are roasted, the warm carrots and sweet potatoes are transferred to a pot to be combined with aromatics and spices before being pureed into a smooth mixture. The source of the heat in this dish comes from the hint of chipotle powder that can be increased as desired. Other than the original sweet flavors of the caramelized carrot and sweet potato, we topped this dish with a drizzle of maple syrup. The maple syrup not only ups the sweetness but also compliments the chipotle flavor of the soup. The combination of maple and chipotle is wonderfully playful and really elevates the dish. The final addition of salted pumpkin seeds adds a bit of crunch, salt, and seasonality to help bring the whole thing together. This is a rich soup with a dynamic flavor, making it perfect to serve as the main meal or as a smaller appetizer for a dinner or cocktail party. To serve it as an appetizer that is also easy to eat, try pouring the soup into shot glasses so that guests can drink the soup in a couple sips, while holding a cocktail and still maintaining conversation. Whether you choose to serve this for a comforting and healthy weeknight meal or as an easy appetizer, we are sure that you will love the amazing combination of flavors in this simple dish. Transfer the carrots and sweet potatoes to a sheet pan. Drizzle with olive oil, salt, and pepper. Place in the oven and roast for 20 to 25 minutes or until the vegetables have begun to caramelize. Meanwhile, melt the butter in a large pot over medium heat. Add the onion and sauté until soft and translucent, about 8 to 10 minutes. Add the chipotle powder and stir well to combine. Add the warm cooked carrots and sweet potatoes to the onions. Stir and then add the vegetable broth. Bring to a boil, then reduce to a simmer. Cover and simmer over low heat for 10 to 15 minutes to allow the flavors to combine. Using an immersion blender, blend until smooth (if necessary allow the soup to cool slightly and transfer to a blender. Blend in batches and return to the pot). Adjust the seasonings and ladle into bowls. Top with a drizzle of maple syrup and pumpkin seeds. Serve immediately.